I've been thinking a lot lately about what I want this place to be. What the purpose is of this blog. It has come a long way in the 15 months of its existence: from the vague beginnings of wanting "just one more platform to put pictures on", over being my personal therapist helping me to come to terms with my depression, to trying to win/get some free stuff (which, btw, I'm not succeeding at. My heart isn't entirely in it, to tell you the truth.). I'm not ashamed of any of these motives, and in a way, have stayed true to them all this time. I still love to share photos; I will always use this space as a place where I can think out loud, and figure out problems; and to be completely honest, if someone would offer me a free dress, do you really think I would turn it down? Ha, no way! All that is fine and dandy, but it's not enough. You see, at the core, what I have needed throughout my life, is someone who would make me feel understood. Less alone. Who would tell me that it is not only okay to feel different, but that it is awesome! Weird is great, and the weirder, the better! For many years, I struggled hugely with the concept of people lying about their life. You see, I didn't know they were lying. I took it all at face value. And as a consequence, I felt immensely inadequate. My family wasn't as perfect as theirs. My relationship wasn't as good as theirs. My entire life was lacking. I thought something was wrong with me. That I wasn't deserving of a life as perfect as theirs. The fault lay with me, surely? I wasn't pretty enough. Submissive enough. My tongue and my temper got me into trouble. I was too self-absorbed. Ungrateful. The list went on and on. It was so bad that I couldn't stand silences. When I was in my car, I listened to music. On walks, I listened to audiobooks. Before bed, I would read until I fell asleep with the book in my hands. I loved stories, sure. Still do. But more than that, I couldn't stand my own company. I was scared of my thoughts, because I felt so unworthy. If there was silence then all my insecurities would come crashing down on me, assaulting me with a viciousness that was scary. So I avoided it at all cost. Okay, that was the intro. Here is the revelation, my "aha"-moment if you will: Over the last 15 months, I have immersed myself in reading people's stories. I've read hundreds of them. Some of them I read religiously every day. Others, I stumbled upon once, soaked in, but then drifted away from. Sometimes, because it was enough. Other times, because I couldn't find them again. Or, simply, because I felt I had learnt the lesson that was meant for me. What those 15 months have taught me was astonishing in its simplicity: I was not alone. Whatever thoughts I've had before - somebody else had them, too! Whatever doubts, fears, insecurities I had - there were other people out there who had them, too! Let's stop for a second and remind you all of my age: at the time I had those revelations, I was 33 years old. Entirely too old, in my opinion, to not have learnt all those valuable lessons before. Granted, I am a bit slow in picking up stuff at times. My grandmother calls me a "late bloomer". But despite this, I think the main reason is that people are such good bluffers. And for gullible folk like me, who used to believe everything, it was very tough to learn that some people don't tell you how it is. They have their "official face". There is one for the outside world, and then there is the real one. Admitting to one's faults is never easy. But here is the thing: if we would all do it, it wouldn't be a big deal any more. But since we don't, there will always be people who see it all as a game. A game they must win. As long as everybody knows that's what it is - a game - that would be alright. But we don't. 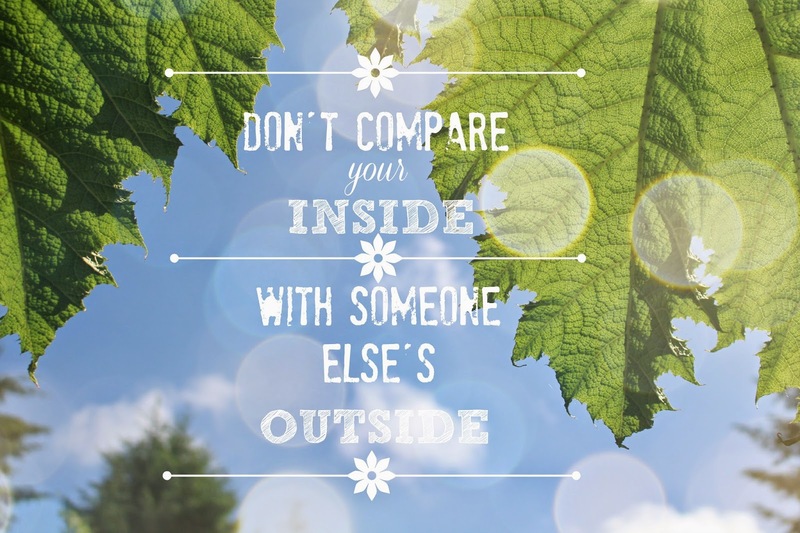 So we compare our mediocre lives to the seemingly gleaming and amazing ones - and of course, we always come up short. It's dangerous, playing games when not everyone knows the rules. I want to blog with intention. I want this place to be one of complete honesty. One that's not primped and primed within an inch of its life. I want realness: real emotions, messes, feelings, bare faces and messy hair. Dusty bookshelves. Carpets with pee stains on them. A marriage that I love, but is it perfect? Omg, so far from it! I want you to know that despite my bubbly personality, I am deeply sad sometimes. Have feelings of a deep-seated inadequacy that I will probably never completely overcome. And you know what? So does everyone else! We are not alone in this. Everybody feels weird, insecure, not good enough sometimes. I'm not a teacher. I can't tell you how to master the storms that lie ahead of you. All I can do is tell you that we all have to go through them; that we are stronger than we think; that you are not alone. What I want this space to be is one of positivity. Where we can laugh at life's weird twists and turns. Where we don't take life, or ourselves, too seriously. I want to share stories of people that I find inspiring. That may help all of us on our own journeys through life. I want to have fun. Laugh, be silly, make fun of myself, tell you embarrassing stories. Humour is the key ingredient to my marriage, it's what makes work enjoyable, and it is my favourite quality in other people. If you make me laugh, you are my friend! This space here is so special to me. I get a lot out of it every day, and I hope you will, too. This is my main goal: creating something that all of you will find enjoyable as well. P.S. 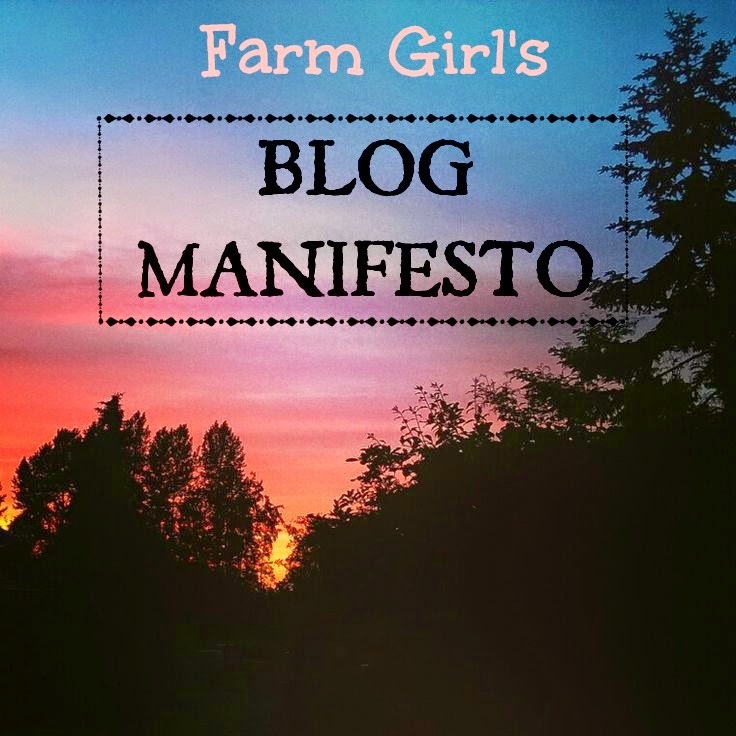 Have you ever written a blog manifesto? If so, please share in the comments, I'd love to read it! This is what I really appreciate in peoples blogs. People who share the ups and downs. It is relateable and it feels like you are not alone. That is how we connect to each other the most. I think a lot of us realize this after we have been in the blogsphere for a while. Great stance for your blog. In total agreement with you, it's also the mission behind my blog: authenticity. To share the highs and lows of everyday life, it's 'not like the movies'. When I first started following blogs it was Atlantic Pacific, Blonde Salad, Cupcakes and Cashmere, all the biggies. The one's who's lives all look so perfect and glamorous and I thought that I wanted to have a fashion blog. I didn't. After a while I began to realise that I would compare my life to theirs and that there were no similarities. Maybe I wasn't good enough, fashionable enough, pretty enough to be a blogger, which is just absurd. But more importantly, that I couldn't relate to these people. That I wanted authenticity. When I found Shannon's blog I was I was SO HAPPY because she was so honest and 'normal' and relateable, and still IS her fabulous self. I think we all need to go through this transition. I'm not saying that all those big bloggers aren't great, they are. But for some, we need to be able to relate and feel a little more 'normal'. Great manifesto Miriam :) also why I follow your blog! Melt my heart why don't you Sarah. I swear sometimes I wish I was a little less authentic. I'll go back and reread posts I wrote and I swear I just want to curl up and hide. It's hard to see the less than beautiful parts of yourself sometimes, but you know what, at the end of the day I really wouldn't have it any other way. I feel so lucky to have found about a dozen or so bloggers that I absolutely adore and am in awe of because they so bravely share themselves with us all. Sometimes it's through their blog, other times it's via email. Love you both and Miriam, beautiful manifesto! "Whatever thoughts I've had before - somebody else had them, too!" Yes! This is one of my favorite things about blogging! Well, I'm me and I am as I am. Living in isolation, only my love is the only contact. Sometimes I wish it were otherwise. But how do I do not know. - Well, we live for ourselves. Sharing the pictures of beautiful interesting things. For others to notice and also pleased. This could be my blog manifesto. Compare with other peopleI don't want and I can not. Why should I? Dear, your blog is fabulous! I love the honest down to earth blogs, where I feel like I'm reading about a real person. We sure do all struggle with insecurities and depression. Blogging is a fun way to reach out and connect. Love your blog! I love your manifesto! I feel like you bring so much honesty and are so genuine in your space...love it! I always find myself relating so much to your posts! Thank you for being you :) Also, I really like the first graphic, the colors are great! So fantastic and honest and authentic!! The real you is just laid out there and I love it. Keep up the excellent writing and keep those gorgeous photos coming - I so enjoy your blog. So beautiful, it's like you took the words out of my month and wrote it, in a probably ironic way, so perfectly <3 Thank for sharing, truly inspiring!